Thank you for choosing Preschool and Kindergarten Pro WordPress theme! The theme was created with love. We recommend everyone to go through each/ty step of the documentation to have a better understanding of the theme and its features. Make sure Preschool and Kindergarten Pro is compatible to your WordPress version. Preschool and Kindergarten Pro will work with 4.5 and above versions of WordPress. 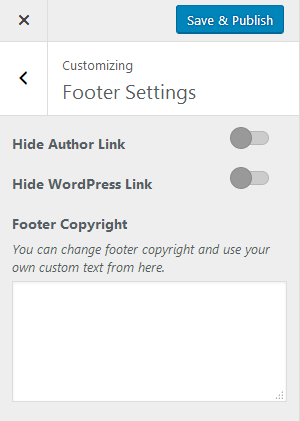 After you have the latest version of WordPress, save the downloaded Preschool and Kindergarten Pro theme somewhere handy on your computer, as you will be using the included files for the rest of the installation process. A WordPress Theme Files— This (preschool-and-kindergarten-pro.zip) is a compressed WordPress theme file containing all of the required templates, images and icons required for the theme to function properly. 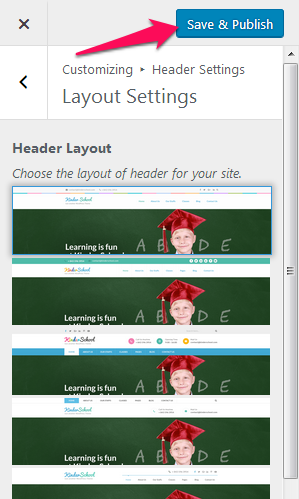 You can install the ‘Preschool and Kindergarten Pro’ theme in two ways: via FTP/Cpanel or via WordPress Dashboard. Choose the method that suits you the best. Click on “Browse…”, select the “preschool-and-kindergarten-pro.zip” file from your computer and click Open. Unzip “preschool-and-kindergarten-pro.zip” file on your computer. Upload the unzipped Preschool and Kindergarten Pro folder into the “wp-content/themes/” folder. You must install the following plugins to get the best out of Preschool and Kindergarten Pro theme. Jetpack by WordPress.com (Automattic): The plugin provides a variety of complementary features for your Theme. 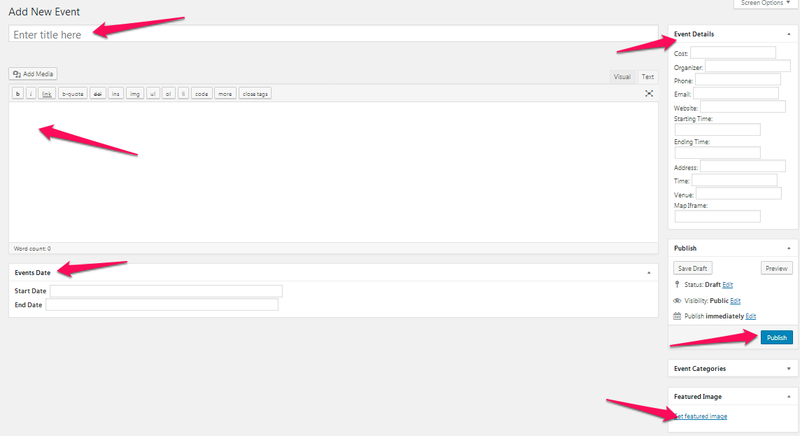 You must install and activate this plugin to enable Newsletter section on homage page and about us page. 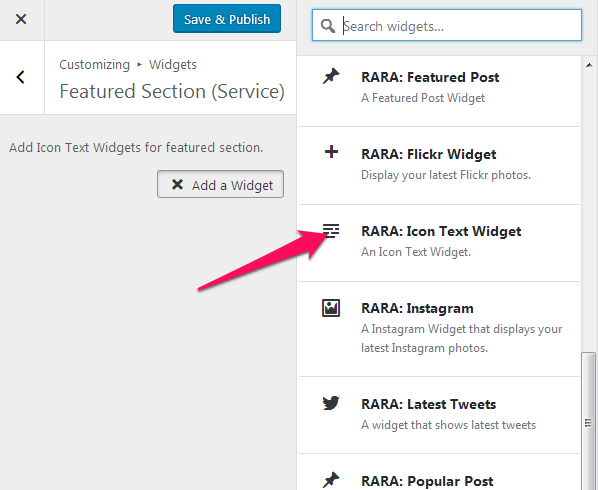 Rara One Click Demo Import by Rara Theme: This plugin will help you import demo content of our themes with a click. 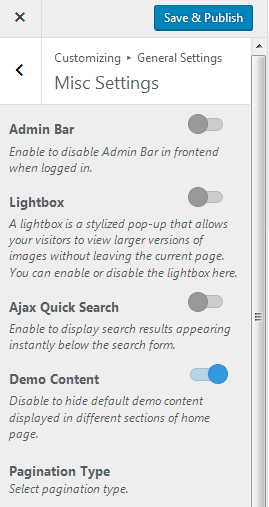 So, if you want the demo of this theme, install and activate this plugin. 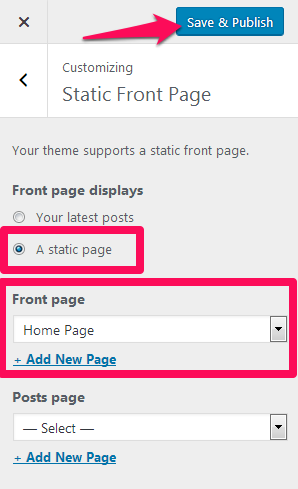 To setup/configure the home page, you must first create a page. 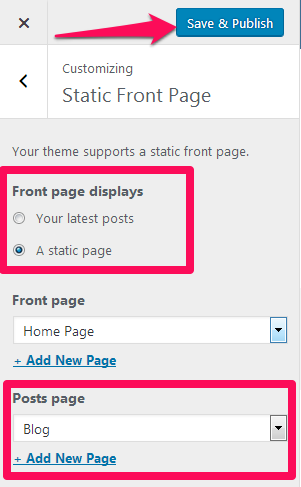 Choose the page you want to set home page as Frontpage. 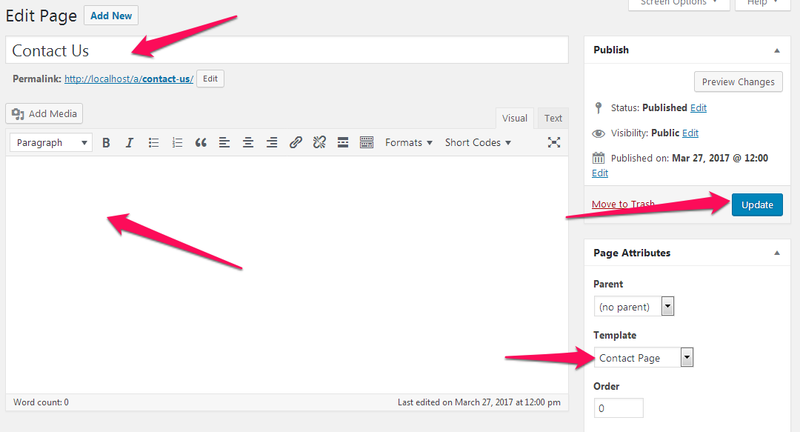 You can display your blog posts on the blog page of your website. 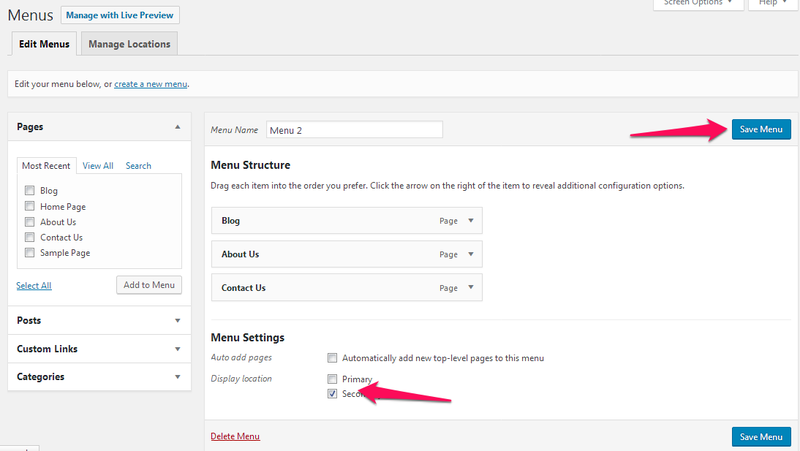 To configure/setup the blog page, you must create a separate page for blog posts. 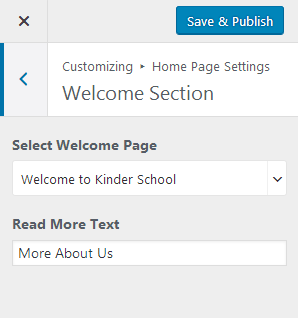 When you install and activate the Preschool and Kindergarten Pro theme for the first time, the demo content of the home page of the theme (link here) will be automatically displayed on your website. If you want to import complete demo of the theme, please refer here. You can make Preschool and Kindergarten Pro theme one page. 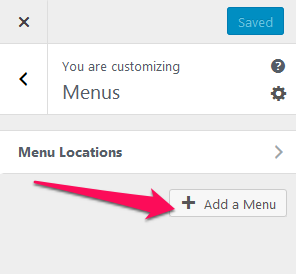 The different sections of the home page will be displayed as Menu. You can directly go to the specific section of the front page on a one-page website. You must install and activate Contact Form 7 Plugin to add or configure contact forms. 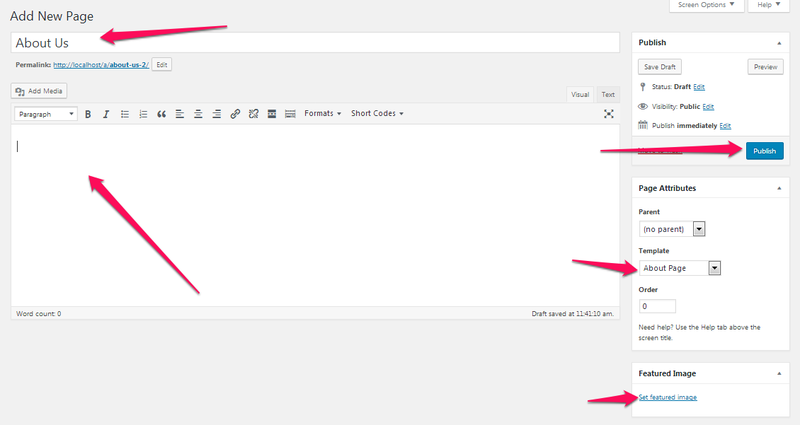 Enter Email Label and Email address for the header. The email address appears only on certain headers. Enter Opening time label and time. The opening time appears only on certain headers. Enter titles for the respective posts. If you leave the field empty, the default titles will be shown. Choose the default layout for the posts. 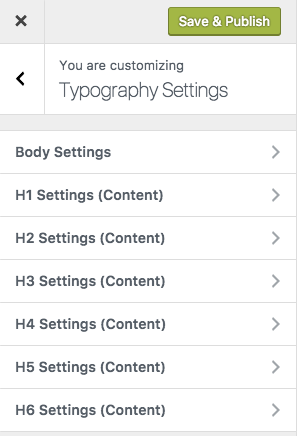 Layout changed in individual posts will override this setting. 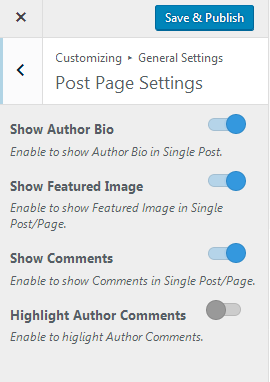 You can configure various settings– post page settings, blog page settings, breadcrumb settings, meta settings for posts and social sharing buttons for posts here. 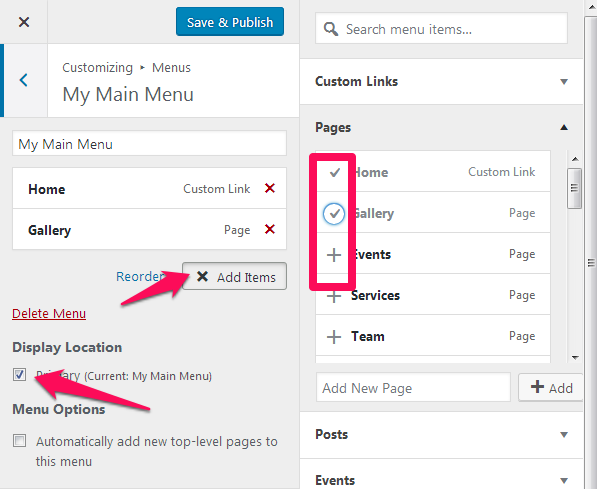 You can change the layout of the blog page and also exclude categories of your choice from blog page here. 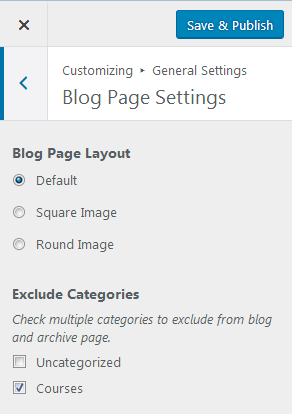 Go To Appearance> Customize> General Settings > Blog Page Settings. Check the categories you want to exclude in blogs. 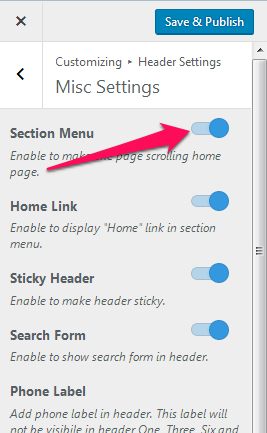 You can change misc settings (Admin bar, Lightbox, Quick Search, Home Page Demo Content and Pagination Type) here. 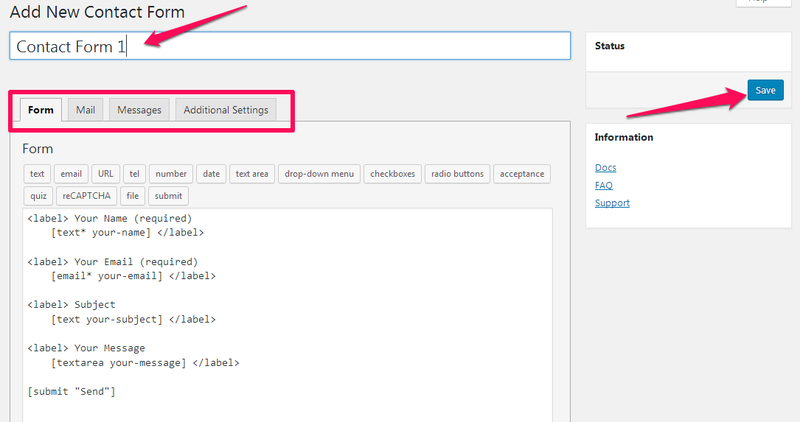 Enable/Disable Ajax Quick Search. 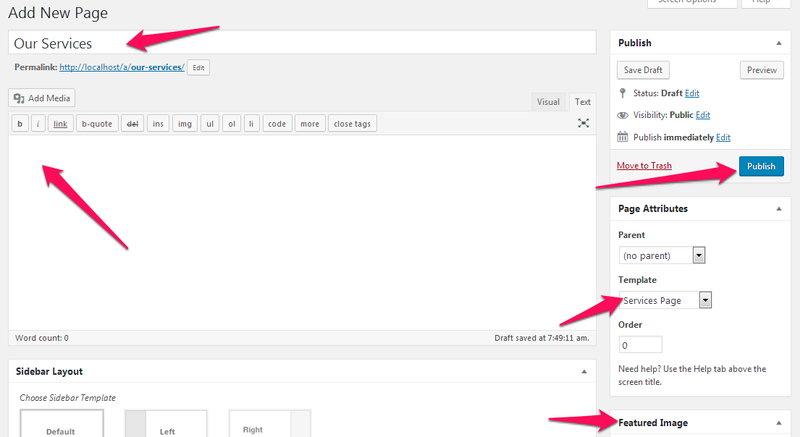 Ajax Quick Search displays search results right below search bar. Blue color is enabled. 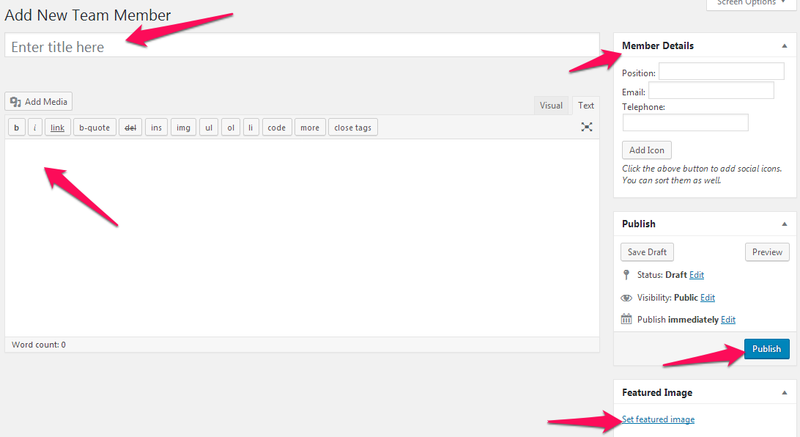 You can manage and edit home page sections here. 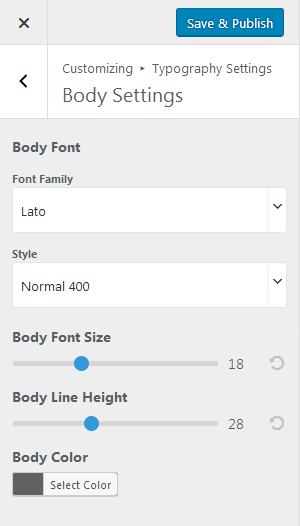 You must be on Home Page to customize the sections. 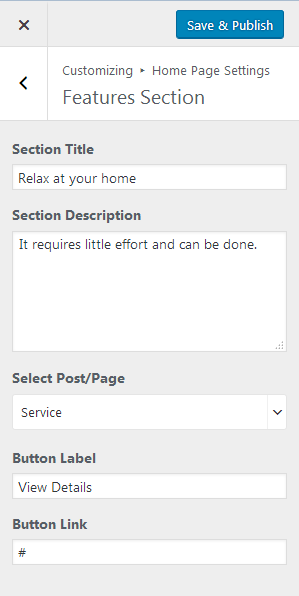 Also, make sure you have set the home as static front page. 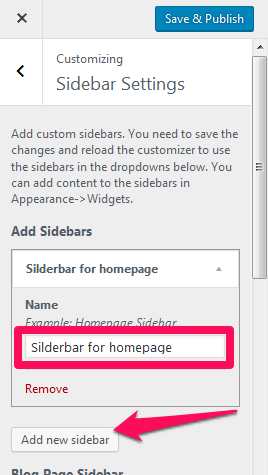 You can enable or disable home page slider and modify the slider section here. 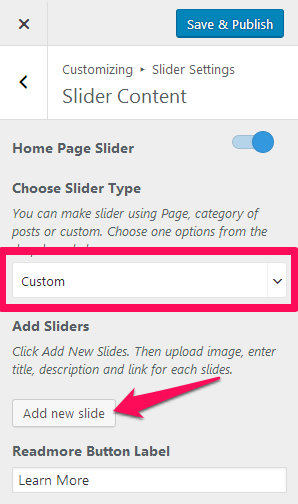 Enable Slider Auto to make slides transition automatically (while scrolling) without a click (Blue is enabled). 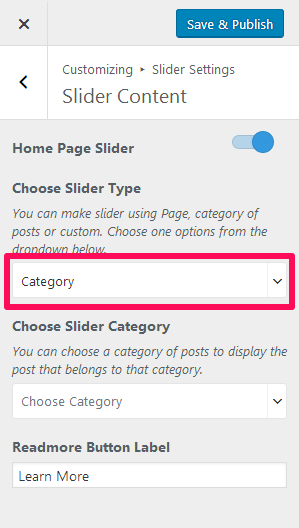 Enable Slider Loop to allow the slider to repeat selected posts automatically. 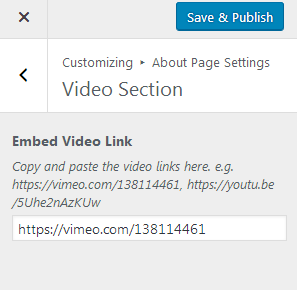 Enable Slider Caption to show the post title to appear on the slider post image. 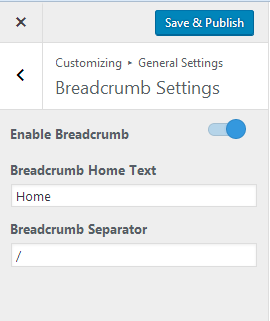 Enable Slider Caption Background to add a background to the slider caption. The featured Image of the posts under the selected category will appear as Slide Images. 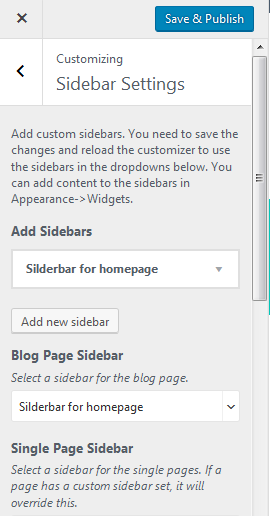 Enable Slider Caption Background to add background to the slider caption. Display a short welcome message and tell something about your company in this section. Select a Welcome Page. If you don’t have a page for the welcome message, you can create a page. The title, description (excerpt) and featured image of the selected page is displayed as the title, description, and image of this home page section. You can display various activities organized by your institution here. Select posts to display on this section of the homepage. You can show up to 3 posts in this section. 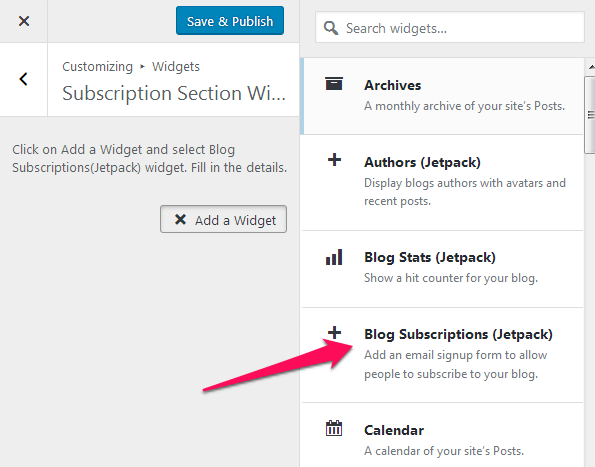 You can display and configure the subscription/newsletter section on the home page. 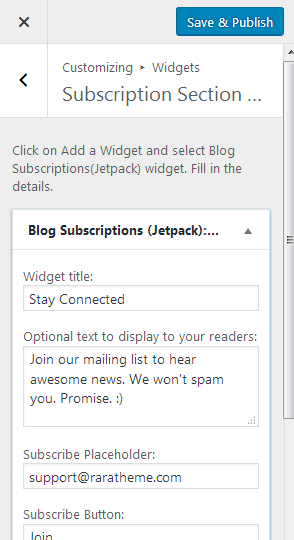 To enable this section, you must install and activate Jetpack plugin. 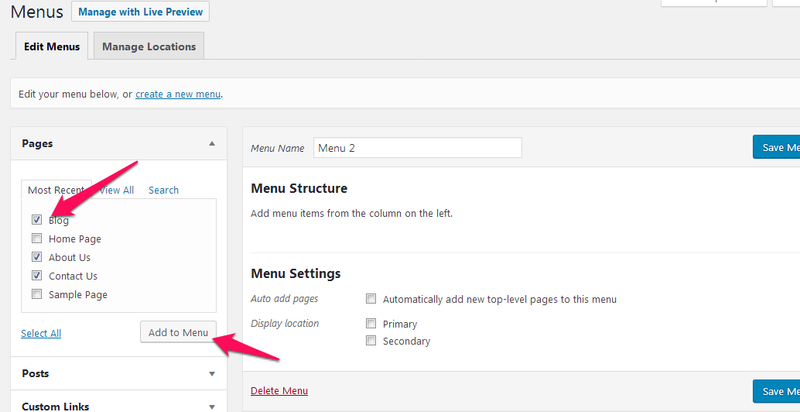 Once the Jetpack plugin is activated, from WordPress dashboard, go to Jetpack> Settings. In the Discussion tab, enable Subscriptions. 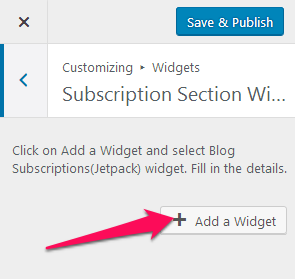 Once the subscription module is activated on Jetpack plugin, you need to configure the subscription section. Fill in the subscription/newsletter form details. Showcase the unique features of your organization in this section of the homepage. Select Post/Page. The content of the selected post/page will be displayed in this section. Enter the link of the page/post in Button Link. You can show the upcoming events in this section of home page. To show the events, you must first create events. 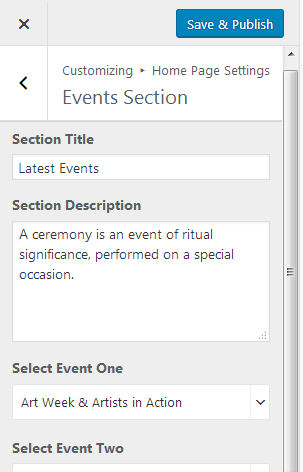 Select the events you want to display on home page. You can show 3 events in this section. Enter Button Label to show more events. The button links to the Events archive page. You can display a Call To Action button to promote your company in this section. 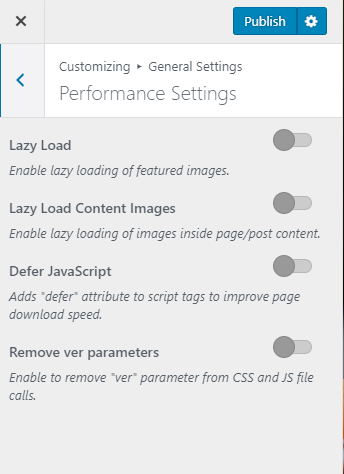 Go to Appearance> Customize>Home Page Settings> Promotional Section. 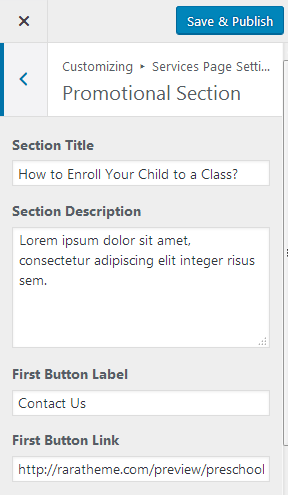 Enter section title and section description. Enter Promotional (CTA) Button Label and Button Link. You can display the courses you offer in this section of home page. To show the courses, you must first create courses. Add images for the slider for the course. The slider will be visible in the course post. Set a featured image for the course. 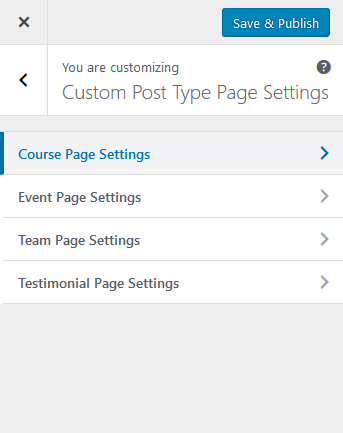 Select the courses you want to display on home page. You can show 3 courses in this section. 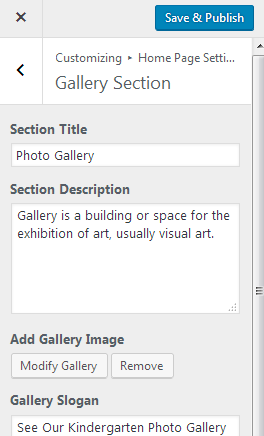 The title, description (excerpt) and featured image of the selected courses will be displayed in this section. 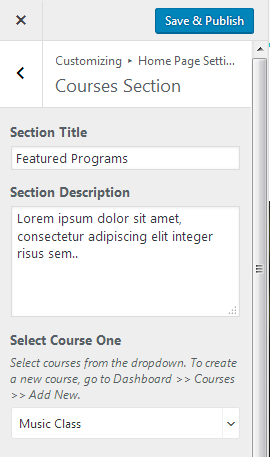 Enter Button Label for courses. The button links to the Courses archive page. You can display the team members in this section of home page. 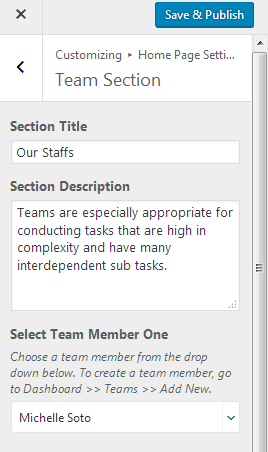 To show the team members, you must first create/add team members. Select the team members you want to display on the home page. You can show 3 team members in this section of home page. The title, description (excerpt) and featured image of the selected team members will be displayed in this section. Enter Button Label for team section. The button links to the Team archive page. You can show the testimonials about your company in this section of home page. You must add testimonials first. Enter the testimonials given by the person in content area. Select the number of testimonials to show in the home page. Select the Testimonial Order. Select Post Date if you want to show latest testimonials first. 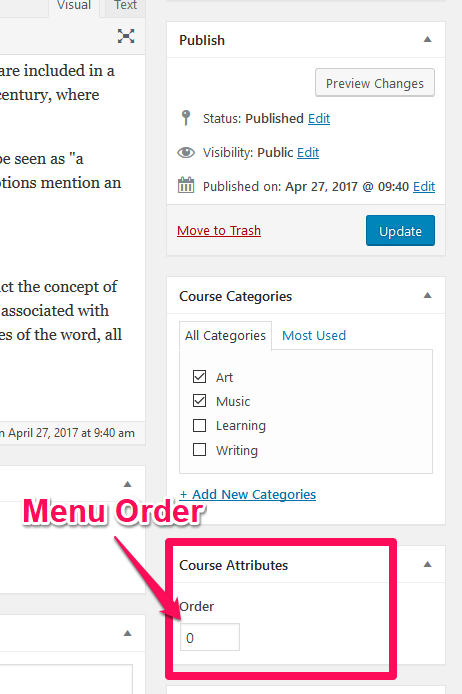 Select Menu Order if you want to display testimonial according to the order you assign them while publishing. Enter Button Label for testimonials. The button links to the Testimonial archive page. You can show the photos of your institutions in this section of the home page. Enter the Gallery slogan, Button Label and Link to show the complete gallery. 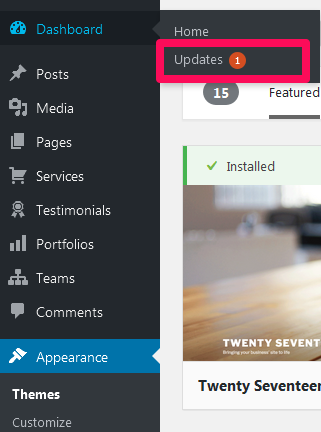 You can display your recent blog posts in this section of the home page. 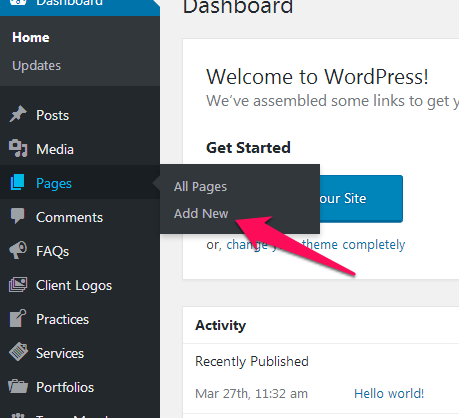 You must setup a blog page first. 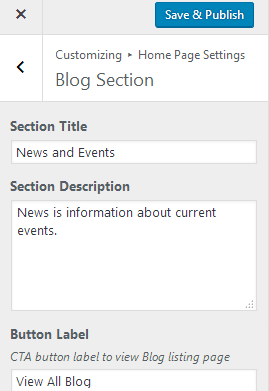 The most recent blog posts will be displayed in this section. Enter the View All button label. The button links to the blog page. 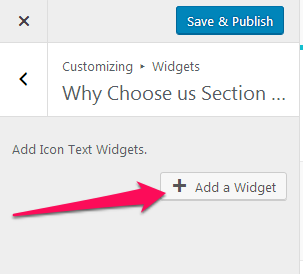 This section will help you can create a call to action button. You can display the contact information and location of your institution in this section. 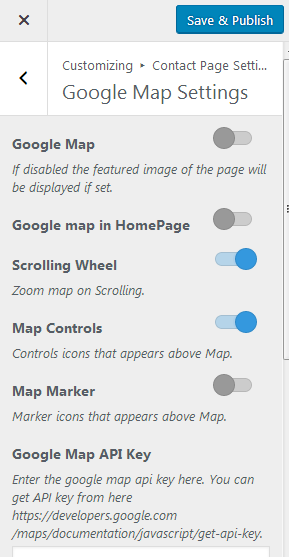 You can configure the map from Appearance >Customize>Contact Page Settings> Google Map Settings. Enable/Disable the Email and Phone Number from header. 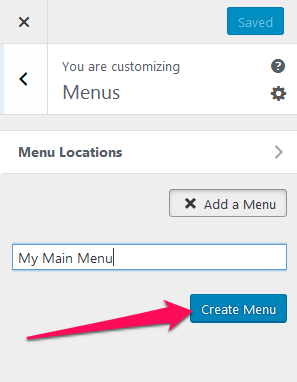 If enabled, the email and phone number of the header will be displayed in this section. If disabled, enter the phone number and email. You can rearrange or show/hide home page sections here. Enter the contents for the about page in content area. You can place a video describing your company in the about page. 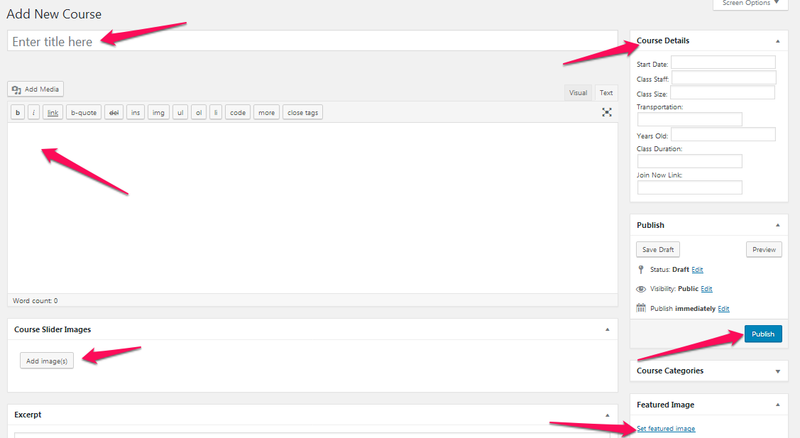 You can configure and display a why us section in about page here. 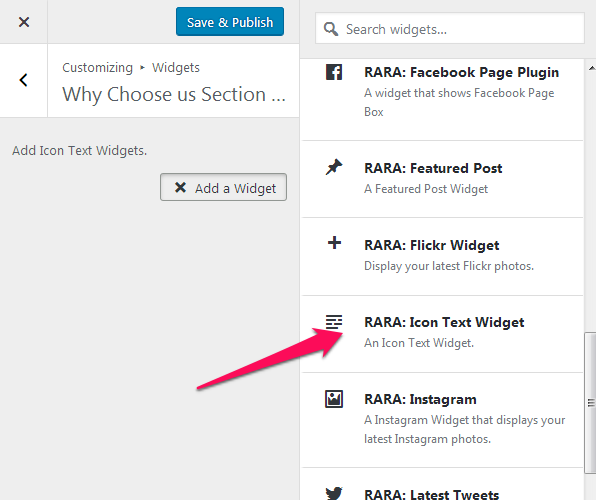 Select RARA: Icon Text Widget from the list of the widgets. Enter Title, Content, Link in the widget. Try to use title, short description and link that describes your company. Select Style and Image or Icon. 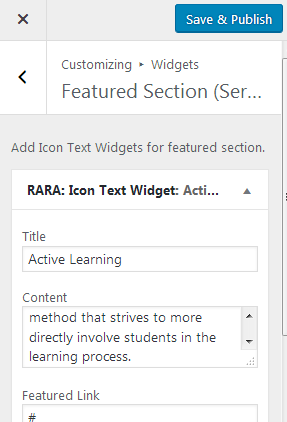 Click “Add a Widget” if you want to add another text in this section. 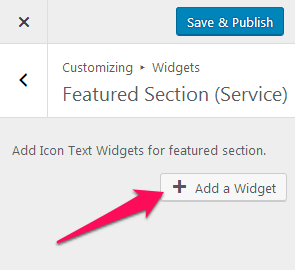 You can edit sections of your services page here. 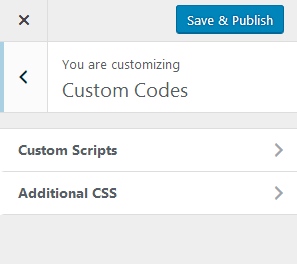 You need to be on the services page to modify the page. So, you need to create a services page first. Enter the Title for the services page. Enter the contents for the services page in the content area. 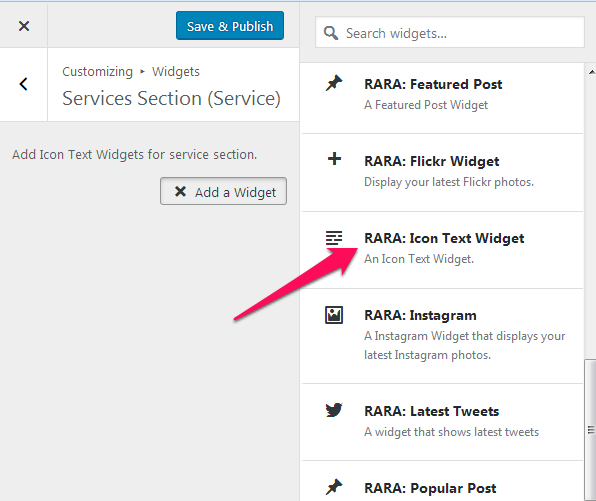 You can add the list of services you provide using RARA: Icon Text Widgets here. 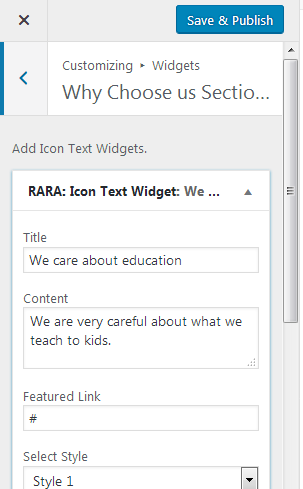 Enter Title, Content, Link in the widget. Use title, short description and link that describes the service. 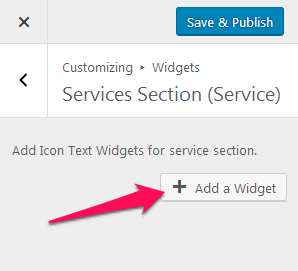 Click “Add a Widget” if you want to add another service in this section. 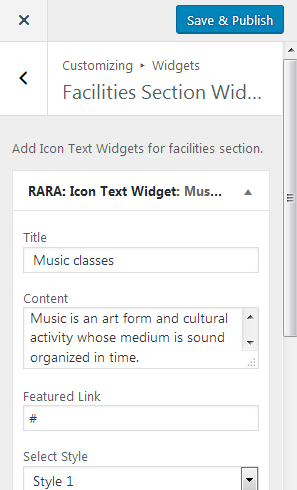 You can add title and description for facilities section of the services page here. Enter Section title, Description and Background Image. Enter Title, Content, Link in the widget. Use title, short description and link that describes the facility that you provide. 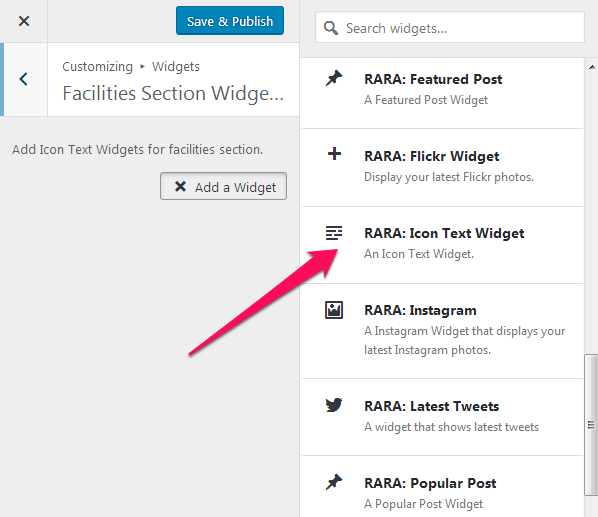 Click “Add a Widget” if you want to add a facility in this section. You can add the featured services in this section. 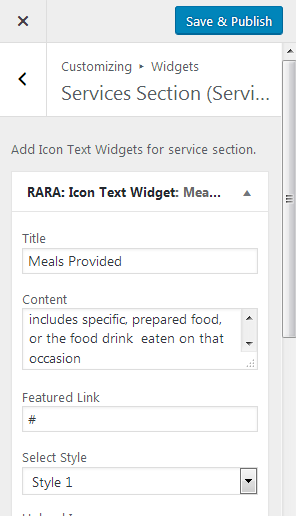 Enter Title, Content, Link in the widget. Use title, short description and link that describes the featured services that you provide. 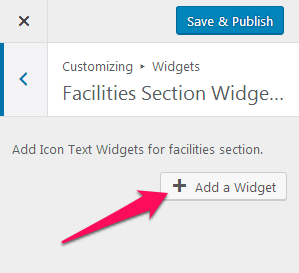 Click “Add a Widget” if you want to add facility in this section. You can use this section of the services page to create a call to action promotion. Enter the contents for the contact page in content area. You can place a google map of your company’s location on the contact section of home page and contact page. Enable Google Map if you want to display map on contact page. If you want to show the featured image of the contact page instead, disable Google Map. 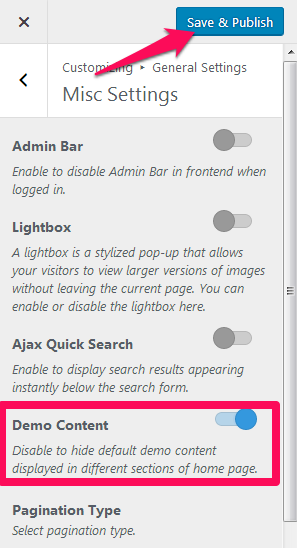 Enable/Disable Google Map for home page contact section. Enter Google Map API Key to show the map on the page. Map won’t be displayed if you don’t enter the correct API key. You can get the key here. You can add contact details here. You can add a phone number and address of your company. You can also add a contact form in the contact page here. To configure/add a contact form, see here. Enable/Disable the contact details as in home page. If enabled, the contact details of the home page will be displayed. If disabled, you can enter the contact details (Address, Phone number and email). Choose a Contact Form to display. If you haven’t created a contact form, see here. You can change the order of the posts in the archive page in this theme. 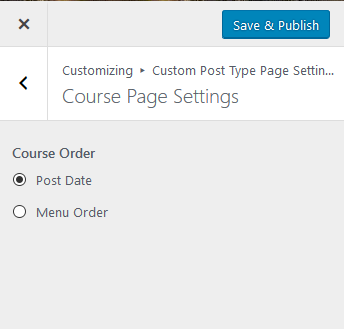 The custom posts archive page can be displayed either using latest posts order or by defining the order in the post itself. 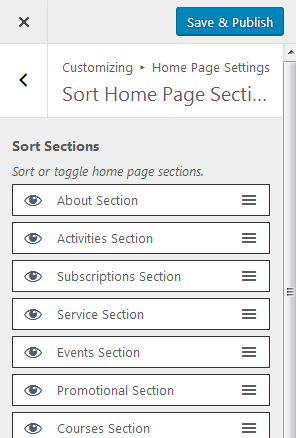 Select the Page you want to the change order of. Select Post Date if you want to display latest posts on the top. 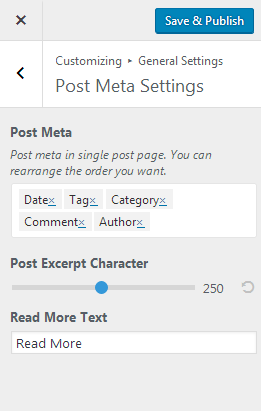 Select Menu Order if you want to display posts according to the order you define while publishing the posts.